First thing in the morning, I have my cup of tea, tidy the bedrooms and come and do some blogging. I love this time of day, it gives me a chance to get up to date with everyone plus I get some great inspiration too. 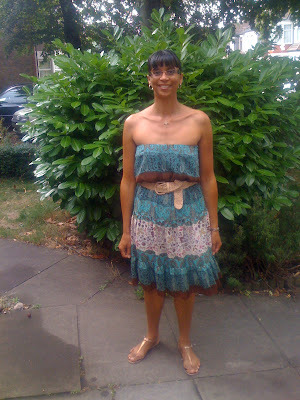 Well, thanks to Savvy Gal's latest post, I thought I would give my maxi skirt a different look and try it as a dress, belted up. 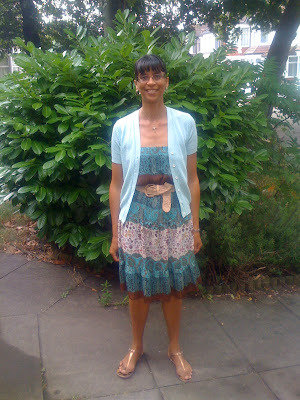 I thrifted a lovely vintage cardi on Tuesday-I think it is ideal with my dress/skirt!! Thanks for inspiring todays outfit, Savvy Gal!!! the skirt is real pretty when worn as a dress. and you always look soo cheery! Ah, so stylish and original! I just love the dress/skirt-belt-cardi combo, Sharon, looking fabulous. Hi eleh-so kind, thanks my dear!! Hi fabulously broke-thanks very much-2 for 1, haha!! Hi Ida-I think it was worth trying for one day-thanks!! H wendy-thanks so much my dear!! I love dresses with such a shape! Awesome :). Hi rose valentine-so kind, thanks! Hi nadine-thanks a lot my dear! thank you for you comments. I am glad I inspired someone this savvy morning. I think I want to find more skirts in various colors. Have a wonderful day! love the dress, too cute! Hi savvy-thanks for your inspiration today, a great idea! Hi makeupbyrenren-thanks so much for your lovely comment! So cutee!! Ya know, you're in great shape for a mother. Did I ever tell you that? Did I? Well mama, you are! Hott mama ;]. LOVING this belt on you. it creates such a slimming silhouette and with the little cardigan, it's simply perfect! Hi secretista-LOL-what a fabulous comment!thanks so much !! Hi cupcakes and cashmere-thanks so much! I do love this belt, its so versatile and being neutral goes with anything! maxi skirts are so great! My dad actually got me a bunch, and I wore them just like that! Hi kate-thanks so much, I thought I would try this skirt/dress for today!! I agree, a cup of tea first thing is a must for me! Hi richel-yes, it is such a versatile idea!! thanks for stopping by! Very cool Sharon! Love the flowers and the belted waist, just my kind of look. The cardigan is perfect for this dress! Great work, Savvy & Sharon!! great idea, and you wear strapless so well! that is a lovely skirt as dress - i like it with and without cardi! The skirt looks great as a dress. Love what you did with the belts! Hi Silje-always lovely, thanks a lot my dear!! Hi fashion Herald-thanks, its still a look I'm trying to get used to! Hi arielle-thanks, I've just had mine today, haha!! Hi karima-thanks for your lovely comment!! Hi nay'chelle-so kind, thanks a lot!! isn't the morning the most divine time of day, I'm at my most inspired...just like your outfit! Hi Imelda matt-yes, you're so right-thanks so much too!! fantastic outfit ))) you combine everything flawless! Hi angel-so nice of you, thanks!! How pretty. Isn't blogging great because of this? (inspiring one another) very pretty color on you. PS: I wish the pins were real too! ♥ ♥ How fun would that be?? You looks soo great in this. I love the idea of wearing a maxi skirt as a dress. I'm still kicking myself for not buying the vintage YSL skirt that I found in a thrift for $35...I thought I looked ridiculous but maybe I should reconsider. Hi fashion chalet-thanks and you're so right, its lovely to get inspiration from each others blogs!! Hi always in style-so kind, thanks!! I would sprint back to get that skirt-if in doubt, for the price always get a thrifted item! !